We had a great day today. The weather was just fantastic, sunny and cold. I kept thinking that we should be somewhere in the mountains roasting marshmallows and hot dogs. No such luck, but the boys had a really fun day. They played outside all day, they would just bring their rosy cheeks in when hungry. I love days like today. Not too many chores, lovely weather and boys full of beans. :-) They should sleep well. I made this card the other day, but didn't have a chance to post it yet. 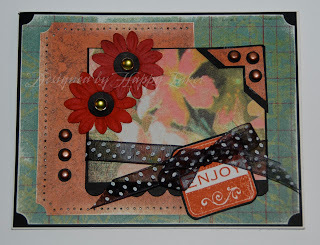 As I didn't make a new card today, I'll use this one. Other: dimensionals (SU! ), Prisma pencils, baby oil, paper piercer, gold brads (SU! ), 1/4" circle punch (SU! 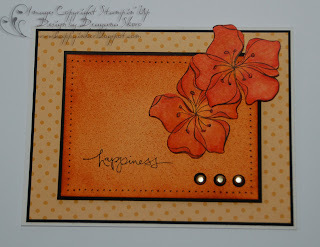 ), Chocolate Chip Stampin' Marker (SU! ), ticket corner punch. I am hoping for another day like this tomorrow. Kids don't have classes, it is a Pro-D day. Keeping my fingers crossed for good weather. Off I go to put kids to bed. Blog y'a later. Next Saturday, January 31st, I am having an open house. The new catalogue is in, Sale-a-Bration is starting on February 1st, enough to get a party going. 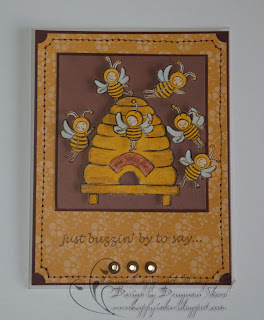 We will do couple of make and takes with supplies from the new Stampin' Up catalogue. You can get your new catalogue for $10, or you can have it for free with a $75 order of SU supplies. This is a no-fee make and take session, but please pre-register so I can prepare enough make and takes. There will be snacks, make and takes, couple of show and tells, and little gifts. Please join me if you're free. RVSP to happyinker@gmail.com or (604) 684-1666 and then come to 3150 Stephens Street in Vancouver. Other: dimensionals (SU! ), Prisma pencils, baby oil, paper piercer, gold brads (SU! ), 1/4" circle punch (SU! ), colour spritzer (SU! ), sponges. Tomorrow a friend is coming over to play in my studio. 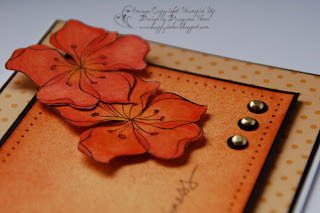 I have to get ready for my Saturday class, we will do few Valentine's cards. My "Love You Much" bundle is finally here (all of it!!!! ), as well as some other new stuff. I love new rubber. Maybe I use this card as one of the non-Valentine's Day cards for the class... we'll see. Kids are back to school and that means lots of running back and forth for me. I love our days on the playground after school though. There is a group of kids that are becoming very good friends, and it is such a joy watching them play. By the time we get home semi-frozen and tired, we're all ready for some hot chocolate and grilled cheese sandwiches made with smoked gouda. Yum. My younger son's school is collecting money for the new playground, they had to take the old one down as it was made with that pressure treated wood that is not safe for kids anymore. Right now, the young kids under the age of 6 have nowhere to play. I would like to help, so I decided to schedule my classes and some make and takes on one Saturday in February or beginning of March, and give all the proceeds to the school. Stay tuned for the exact date and your E-vites. If you're reading this and would like to be invited, but you don't belong to my regular mailing group, send me a quick e-mail or leave a comment and I will make sure to include you in this fundraiser. We had great holidays. It doesn't happen very often in Vancouver, but we had a white Christmas! Oh, joy!! We were out frolicking in the snow, tobogganing, firing snowballs at each other and shoveling. Even shoveling didn't feel so hard. Look at me speak, I shoveled for about 5 minutes, my hubby is a "man", it is his job, so I was not allowed to use a shovel. He drove around in our Volvo with a shovel in the trunk and took on helping people who got stuck all over the place. We are probably the only ones beside the police who have snow tires and chains in this city. :-) I am not sure which he (my hubby that is) enjoyed more - helping people or lecturing them about being on the road with all seasons tires. Santa spoiled us too, my kids got all the toys they asked for, I got few things I was wishing for for a long time, like "Toolset for Dummies". I also got a little "to go" set of pink tools. My other half got saddle bags for his Harley. But most importantly, we got to spend quite a bit of time with our family. I still feel all warm and fuzzy. 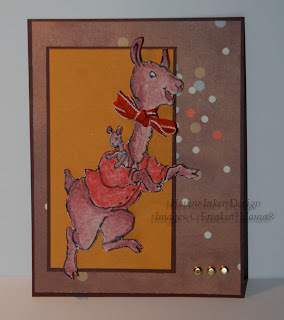 I didn't craft a whole lot over holidays, all those Christmas cards took a toll on me. I recuperated and enjoyed my family. I did work on my craft room a bit. I cleaned it up, purchased Bygel racks from Ikea for my punches, we'll be putting them up today. I do have a card to show though... I saw this sketch somewhere long time ago and jotted it down. I can't remember where though. If you know let me know. 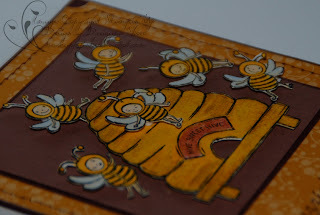 I am not going to list details for this card as I can't remember any of the designer's papers used. :-) Flowers were died with SU! re-inkers. The stamp is a SU! 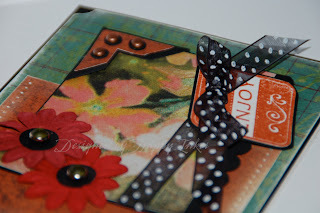 Lovely Labels, photo corners were done with SU! photo corner punch. There you have it.